Texas became a state December 29, 1845, the 28th state admitted to the Union. The village of Waterloo was established on the Colorado River near Shoal Creek in 1837, within the independent Republic of Texas. The next year, Mirabeau Lamar, President of the Republic, instructed a commission to visit the area, in search of a site for a capital. 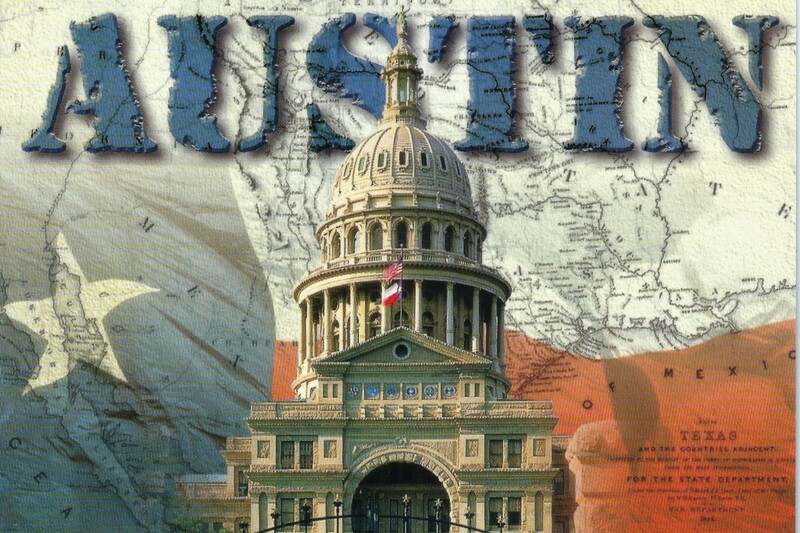 Waterloo and adjacent lands were purchased – 7,735 acres in all – and in 1839 the city of Austin was chartered. Lamar’s successor was Sam Houston, who moved the government to Houston in 1842. Several other cities served as capital before 1845, when Houston’s successor, Anson Jones, called a constitutional convention in Austin. The annexation of Texas to the United States was approved at that meeting, and Austin was once again capital. The name “Austin” honors Stephen Fuller Austin, called the “Father of Texas” because he first colonized the region by bringing 300 families in 1825; however the city’s original name of Waterloo is evident in places, such as downtown’s Waterloo Park. The pink-granite domed capitol, largest of any of the state’s, sits on one of the hills that rises from the Colorado River Valley. Seven hydro-electric dams going upstream bless the area with lakes – Austin and Town Lakes are within the city limits. Modern Austin boasts a seven-block Historic District with restaurants, clubs and shops that attract thousands on weekends for the nightlife scene. Another “nightlife” event is the summer evening bat flight – when the largest urban bat colony in North America emerges from underneath the Town Lake Bridge to forage for insects. The spectacle is one of the most popular attractions in Texas. The energy, the families doing everything, flying kites, riding bikes, pushing strollers, talking, laughing, enjoying life. The music, the food, those gorgeous curving live oak trees. Mountains near: Mount Bonnell, 775 feet, part of the Balcones Fault Escarpment. Guadalupe Peak, in the western tip of the state, is the highest point in Texas at 8,751 feet.